Finally the drama, glamor, and shimmy of belly dance and samba are together as one! 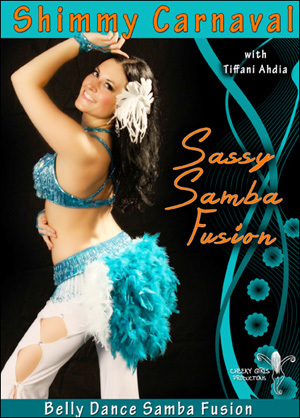 In this unique DVD, Tiffani Ahdia fuses both styles to create an exciting, hip shaking choreography. The key to growth as a dancer is fearlessly trying on something new. Cross training in different styles will help you to become more versatile, creative, and unique. An accomplished performer in both styles, Tiffani takes you out of your comfort zone and brings you a whole new way to move your hips. Several samba moves are broken down and the differences between belly dance and samba are discussed. Then you will learn several innovative combinations that can be strung together into a one-of-a-kind fusion routine. This is a fun workout, very energetic . It is well presented and moves are well explain with much repetition . Just love the beat!!! Not for beginners though. It realy challenges me and the choregraphie is not to long. Good sweat and great workpout. I intend to get more of samba fusion. It was a blast! I’ve learned so much. Combinations 1 and 2 are easy to pick up quickly. And there is enough repetition that you can learn them quickly. Combination 3 gets much longer. It’s been so much fun!